DR FRANK GULINO GRADUATED FROM NEW YORK CHIROPRACTIC COLLEGE IN 1996. 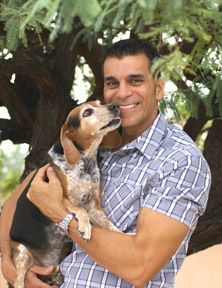 HE HAS BEEN IN PRIVATE PRACTICE IN SCOTTSDALE, AZ SINCE MAY OF 1997. HIS EMPHASIS IS ON FAMILY HEALTHCARE AND WELLNESS, AND HAS PERFORMED OVER 200,000 ADJUSTMENTS TO DATE. DR FRANK'S PATIENTS RANGE IN AGE FROM INFANTS, TO SENIORS WELL INTO THEIR 90's. THE ADJUSTING TECHNIQUES AND THERAPEUTIC MODALITIES UTILIZED ARE FOR THE CORRECTION OF SPINAL AND POSTURAL DISORDERS. BY USING THIS APPROACH, OUR PATIENTS REALIZE THEIR GOD-GIVEN HEALTH POTENTIALS.